Commissioned by NOLA.com | The Times-Picayune for its "300 for 300" celebration of New Orleans' Tricentennial. 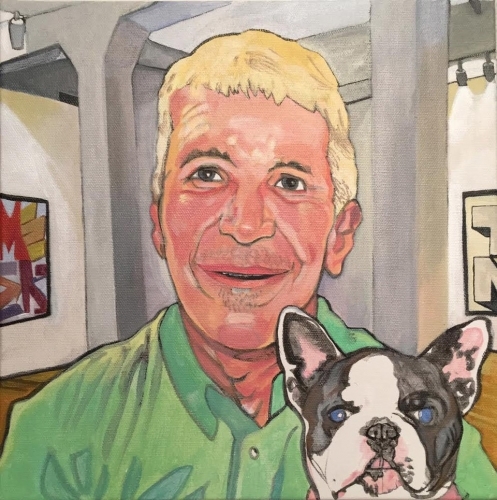 The legacy: With a 5,100-square-foot gallery on Julia Street, Arthur Roger is New Orleans' preeminent dealer in contemporary art, with a roster of artists that has included Ida Kohlmeyer, Robert Gordy, George Dureau, John Scott and John Waters. Roger started humbly in 1978, when his mother mortgaged her Chalmette home so her son could open a gallery at 3005 Magazine St. It was a tough time for contemporary art, especially pieces by local artists, but he stuck it out - and flourished, due in no small measure to his groundbreaking acceptance of black, female and LGBT artists. In 2017, Roger donated to the New Orleans Museum of Art more than 80 of the pieces that had been in his home because, he said, it was time to let them go. Describing Roger's gift as "transformational," Susan M. Taylor, the museum's director, said it both expanded and reaffirmed the museum's commitment to local artists. - He helped launch Art Against AIDS, an annual Yuletide benefit for NO/AIDS Task Force. - His father was a conductor on the streetcar named Desire. - An early exposure to art and its practitioners came when Roger was a young man: He was a framer at a Royal Street gallery. - Arthur Roger Gallery helped arrange the Louisiana Arts exhibition at the 1984 World's Fair. - When office buildings and hotels started putting contemporary art on display, Roger's gallery installed pieces at sites that included the Hotel InterContinental, the Pan American Life Center and the Aquarium of the Americas. - In 2018, Roger received the Anti-Defamation League's A.I Botnick Torch of Liberty Award. - He has served on the boards of the Ogden Museum of Southern Art, Louisiana Children's Museum, Greater New Orleans Foundation, Contemporary Arts Center, Mayor's Arts Commission and the New Orleans Arts District Association. - Junior Achievement has proclaimed him a Role Model.